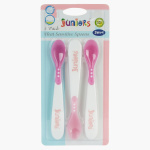 Juniors Heat Sensitive Spoon - Set of 3 | Pink | Strong, durable and hygienic for babies and toddlers. Shaped for little hands to hold. A clean and hygienic way to feed your baby, these spoons come in a set of three. Designed especially for kids, these spoons are heat sensitive making it easy for you to know when the food or drink is hot. The apt shape and size make ensures an easy grip. Feature 2 : The unique heat sensitive feature helps to tell you when the food or drinks is hot. Feature 1 : Strong, durable and hygienic for babies and toddlers. Shaped for little hands to hold.